Vehicle entry fees apply within the park (bikes are free). Vehicle access gate is only open from 8:00am to sunset. 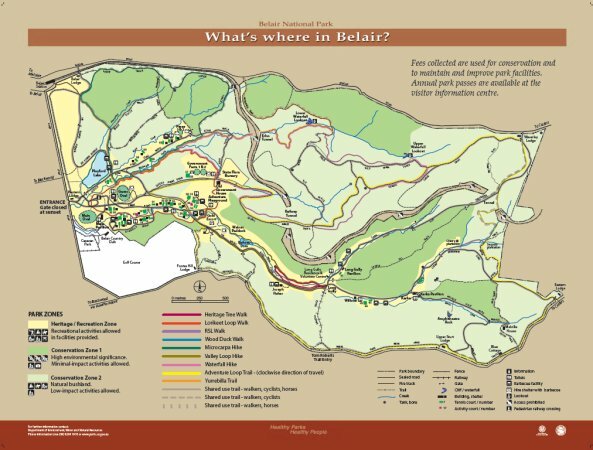 Park information also available from DEWNR web site Belair National Park. The 12.5km “Adventure Loop trail” is a neat intermediate MTB route. The route is fully sign posted and is designed to be ridden in a clock wise direction. Information and a downloadable GPS map are available via the Suggested Routes page. Drinking Water: Yes, refer to trail map for information. Toilet facilities: Yes, refer to trail map for information. Car Parking: Yes, refer to trail map for information (vehicle entry fees apply, park entrance gate is only open from 8:00 am to sunset). Belair National Park is located 13km south east of Adelaide city center. Vehicle access is via the main gate on Upper Sturt Road, Belair. The park can be accessed by bike via several entrances that are not accessible by vehicle. Train transport: It’s about a 40min train ride from Adelaide train station to Belair train station. The Belair train station is on the north west boundary of the park. Belair National Park is in the Mt Lofty Ranges Fire ban district. The park may be closed on days of declared Total Fire Ban for the Mount Lofty Ranges fire district. Web site: Refer DEWNR web site Belair National Park.